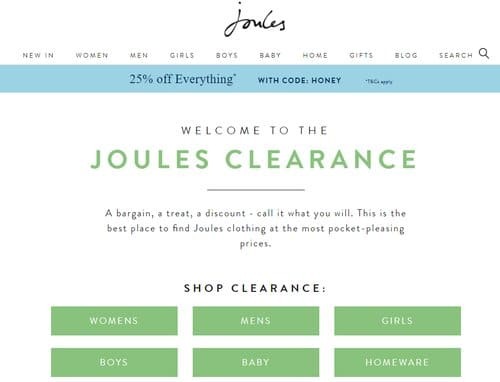 Fabulous news, there is a Joules student discount code to get 25% off all full priced items at joules.co.uk. It’s easy to get, just go to this page and copy and paste the code HONEY. No student ID required, it’s as easy as that! Joules has a stunning collection of quality womens and mens fashion, homewares and fabulous gifts and presents. While these well made items may not be the cheapest, they are crafted to last and are a great investment. The great news is there is a 10% Joules student discount off all full-priced items with an NUS Extra code. However, bigger discounts can be made by students by shopping in the clearance pages and using short term promo codes so check the top of the page. The White Company have a similar range of fashion and homewares so give them a look. There is a Cath Kidston student discount of 10% which is always worth a look. Oliver Bonas have some lovely ladies fashion and gift ideas and students can get a student discount of 10% plus extra savings.